Sure we all continue to scribble in our own private ways-- usually doodling in a notepad during a boring meeting, class, or phone call. But our society doesn't validate or support such amateurism in the drawing like it does in, say, writing or photography. Blogging and digital photography have created massive communities of occasional hacks and paparazzi. Even though the equivalent electronic tools for the visual arts are almost as readily avaiable, the web is not awash with things painterly. True, the visual style of the web lends itself more to flashy modern graphics with clean lines and Photoshop blends and layers, but there's still something to be said for the authenticity (even electronically reproduced authenticity) of human-made brush strokes. 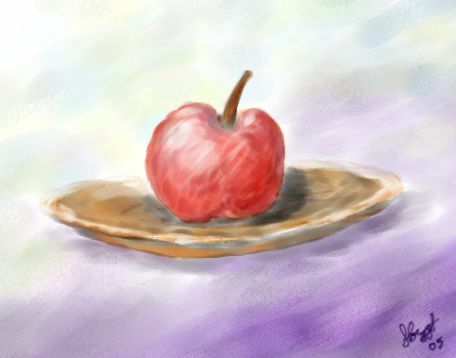 Thus, with the help of Corel Painter and my Wacom Graphire tablet, I've decided to relaim my inner artist. I've had these tools around for years, but never did much more than experiment with the cool brushes and effects. Now it's time to get serious. With the help of some online tutorials and a traditional media drawing book, I'm learning to draw all over again. I've finished my first lesson, and I must say I'm pleasantly surprised with the result. A little guidance goes a long way. I've created a Flickr group to collect my artistic forays, so check back in Photospace occasionally to follow my progress. Posted on July 17, 2005 by Scott Forrest and filed under General.